When images of poor labor conditions in the garment industries of leading apparel-exporting countries reach the global news media, it is often because those conditions seem uniquely and unjustifiably extreme. Malnourished workers working 14-hour days faint by the hundreds in Cambodian garment plants. Hundreds more are killed in deadly factory fires in Bangladesh and Pakistan by owners who lock exit doors when fires start—presumably because they fear that fleeing workers will stop to steal clothes. Yet these images reflect a common basic reality: Garment workers in many of the leading apparel-exporting countries earn little more than subsistence wages for the long hours of labor that they perform. And in many of these countries, as this report discusses, the buying power of these wages is going down, not up. Critics of antisweatshop advocates often argue that concern over poor labor conditions in apparel-exporting countries is misplaced and counterproductive. According to their argument, jobs in garment factories, no matter how low the wages or how difficult the conditions, benefit low-skilled workers because they provide better conditions and compensation than jobs in the informal and agricultural sectors of developing countries. Moreover, they posit, export-apparel manufacturing offers these workers—and, by extension, developing countries—a “route out of poverty” through the expansion of the manufacturing sector. The first part of this argument is largely noncontroversial. Employment in the urban formal economy typically offers better and steadier income than informal-sector work or agricultural labor. Yet self-labeled “pro-sweatshop” pundits have not explained why the price that workers in developing countries have to pay for steady wage employment should be grueling working conditions, violations of local laws and basic human rights, and abusive treatment, except to say that there are always some workers for whom labor under any conditions will be an improvement over the status quo. The second part of the argument, however—that employment in export-garment manufacturing offers a “route out of poverty”—rests on either an extremely low benchmark for poverty or the promise that such work offers the future prospect of wages that actually do support a decent standard of living for workers and their families—that is, a “living wage.” In other words, for the export-garment sector to actually offer workers in developing countries a “route out of poverty,” either these workers’ current living conditions must not amount to poverty or, if they do, these workers must be able to expect to escape poverty in the future with the industry’s further development. Over the past decade, however, apparel manufacturing in most leading garment-exporting nations has delivered diminishing returns for its workers. Research conducted for this study on 15 of the world’s leading apparel-exporting countries found that between 2001 and 2011, wages for garment workers in the majority of these countries fell in real terms. As a result, we found that the gap between prevailing wages—the wages paid in general to an average worker—and living wages for garment workers in these countries has only widened. A comparison of prevailing wages to the local cost of a minimally decent standard of living for an average-sized family finds that garment workers still typically earn only a fraction of what constitutes a living wage—just as they did more than 10 years ago. While these workers may not live in absolute poverty, they live on incomes that do not provide them and their families with adequate nutrition, decent housing, and the other minimum necessities of a humane and dignified existence. We studied 9 of the top 10 countries in terms of apparel exports to the United States as of 2012 and 15 out of the top 21 countries by this same measure. We only studied 15 out of the top 21 countries because we were limited to those places in which we had regular field-research operations at the time of the study. On average, prevailing straight-time wages—pay before tax deductions and excluding extra pay for overtime work—in the export-apparel sectors of these countries provided barely more than a third—36.8 percent—of the income necessary to provide a living wage. Among the top four apparel exporters to the United States, prevailing wages in 2011 for garment workers in China, Vietnam, and Indonesia provided 36 percent, 22 percent, and 29 percent of a living wage, respectively. But in Bangladesh, home to the world’s fastest-growing export-apparel industry, prevailing wages gave workers only 14 percent of a living wage. Wage trends for garment workers in six additional countries among the top 21 countries were also studied in terms of apparel exports to the United States. In four of the six countries—the Dominican Republic, Guatemala, the Philippines, and Thailand—prevailing wages also fell in real terms by a per-country average of 12.4 percent, causing the gap between workers’ wages and a living wage to widen in these countries as well. Garment workers in Mexico, the Dominican Republic, and Cambodia saw the largest erosion in wages. Between 2001 and 2011 wages in these countries fell in real terms by 28.9 percent, 23.74 percent, and 19.2 percent, respectively. In 5 of the top 10 apparel-exporting countries to the United States—Bangladesh, Mexico, Honduras, Cambodia, and El Salvador—wages for garment workers declined in real terms between 2001 and 2011 by an average of 14.6 percent on a per country basis. This means that the gap between prevailing wages and living wages actually grew. Real wages rose during the same period in the four remaining countries among the top 10 exporters that we studied—China, India, Indonesia, and Vietnam—as well as in Peru and Haiti, which were among the top 21 countries. Wage gains in India and Peru, however, were quite modest in real terms at 13 percent and 17.1 percent, respectively, amounting to less than a 2 percent annual gain between 2001 and 2011. Wages rose more substantially in real terms in Haiti (48.2 percent), Indonesia (38.4 percent), and Vietnam (39.7 percent) over the 10-year period. Even if these rates of wage growth were sustained in these three countries, however, it would take on average more than 40 years until workers achieved a living wage. Only in China, where wages rose in real terms by 124 percent over the same period, were workers on track to close the gap between their prevailing wages and a living wage within the current decade. According to our research, Chinese apparel workers are on course to attain a living wage by 2023, but only if the rate of wage growth seen between 2001 and 2011 is sustained. The prevalence of declining wages and persistent poverty for garment workers in a majority of the world’s leading apparel-exporting countries raises doubt that export-led development strategies create a rising tide that lifts all boats in most countries pursuing these strategies. As noted, this report examines actual trends in real wages and other related indicators between 2001 and 2011 for garment workers in 15 of the top 21 countries exporting apparel to the United States. It examines whether and where prevailing straight-time wages for garment workers are actually going up or down in terms of buying power—that is, whether workers are en route out of poverty, stuck in it, or headed deeper into it. As the report discusses, the prevailing straight-time wage rate for most garment workers in most of the countries examined was the applicable minimum legal wage in their respective countries. This is due to several factors, including the widespread practice of governments setting industry- and even job-specific minimum wages, and, in many cases, a lack of worker bargaining power due to limited alternatives for formal-sector employment and low unionization rates. The report compares levels of prevailing wages in 2001 and 2011 to the level of earnings that workers and their families need in order to afford the basic necessities of a nonpoverty standard of living—a living wage—and whether garment workers are actually on a path to reach this goal or whether they are falling further behind. Our research shows that only a handful of the countries examined have achieved even modest growth in real wages over the past decade, and in only one, China, was the rate of growth significant enough that the country’s workers would achieve a living wage in the relatively near term if it were to be maintained. In all of the other countries, there has either been negative real-wage growth or growth that is so slow that a living wage is decades away. Unsurprisingly, growth in real wages for garment workers tended to be most associated with those few countries that have instituted major increases in their legal minimum wages as a means of poverty alleviation and/or avoidance of social unrest and that in most cases also experienced growth in other higher value-added manufacturing sectors, not just garment production. In sum, our research indicates that while the establishment of an export-garment-manufacturing sector may tend to expand formal employment that is more profitable than alternatives in the informal sector or agricultural labor, the growth of an export-apparel industry does not necessarily raise its workers out of poverty when left to its own workings. 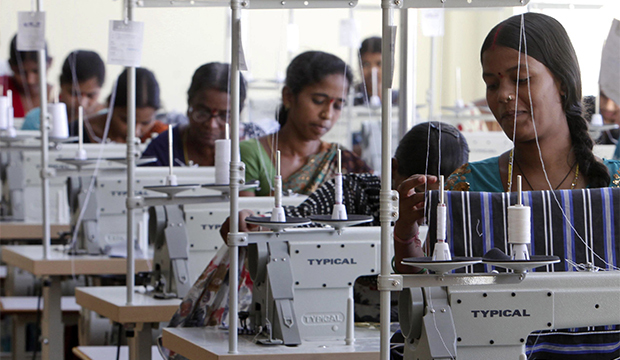 While the expansion of garment-sector employment may have made the very poor initially significantly less poor, it has offered limited opportunities for workers in most of the major apparel-exporting countries to make further upward progress toward an income that offers them a minimally decent and secure standard of living. Instead, in most of the leading apparel-exporting countries, the wages for garment workers have stagnated or declined over the past decade. Wages have only risen significantly in real terms in countries whose governments have taken affirmative steps to ensure that workers share the rewards from the industry’s growth and whose manufacturing sectors have diversified to put apparel factories in competition for labor with makers of higher value-added goods. This paper was prepared for the Center for American Progress by the Worker Rights Consortium. The WRC is an independent nonprofit organization that investigates and reports on working conditions in the global apparel industry.